It was a typical stride along an empty seaside, with my good friends. Chatting… strolling… relaxing. This was not a “fabulous” beach. No magazine had ever written anything extraordinary about it… There was no obvious beauty there. Quite the contrary! And it was winter. Probably not what you have come to know about Greece. Certainly not a “Greece of your myth”! We were walking slowly along the pebbles. 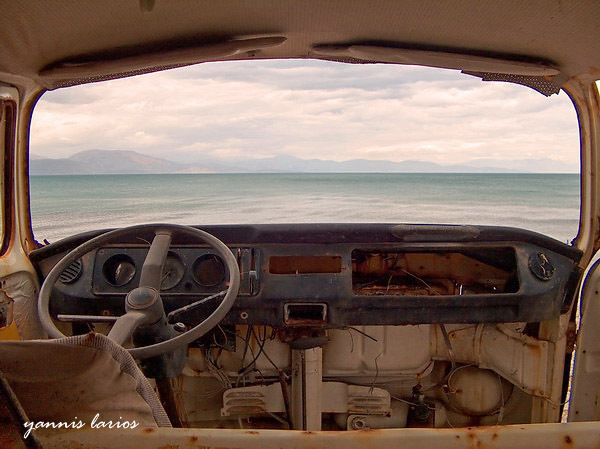 And the typical Greek carelessness struck upon us again: An abandoned Volkswagen small truck lying there, rusting. It was placed in a way like staring at the sea. But it was abandoned by the typical idiot who doesn’t care about anyone else! Left to oblivion. The beach was not that perfect. And the inclusion of this relic, really made it worse…. Or was it not? Could you make something out of garbage? Was there a contrast somewhere? I decided to enter the abandoned truck, my camera (as always!) in my hand. Not to my surprise I was yelled at, by my friends: “Get out!“, “It’s dangerous! There might be snakes!“, “What are you trying to do, you fool?“. That’s what friends are for in any case! Well… I entered! It was a really difficult exposure though. But the tripod proved helpful. Two shots, one exposed for the sea, one exposed for the interior… And the “Works of Man versus Nature” was more apparent than ever! I even got some apologies back for the yelling that I had sustained. Small victories of an enthusiast photographer! This entry was posted in photography, photos, Stories behind photos, Temeni, Yannis Larios | Greek Travel and Wedding Photographer. Bookmark the permalink.